Cosmopolitan China is giving us major eye candy for their July cover featuring Han Geng, Zhang Yixing and Fan Chengcheng. Han Geng is currently a Chinese Mandopop singer and actor who was a former K-Pop idol and a former member of Super Junior. Zhang Yixing is also a Chinese actor, singer and songwriter and currently a member of the K-Pop band, EXO. Fan Chengcheng is the younger brother of Chinese actress, Fan Bingbing, and a member of NINEPERCENT after finishing in the top 9 of Idol Producer which incidentally was hosted by Zhang Yixing. I have tried jumping on the K-Pop and evolving C-Pop bandwagon but I could never get it. I guess it's primarily because I don't understand Korean and I don't particularly like that they go far too extreme with their looks. I mean the guys looks great and a bit toned down for this magazine cover except for Fan Chengcheng. 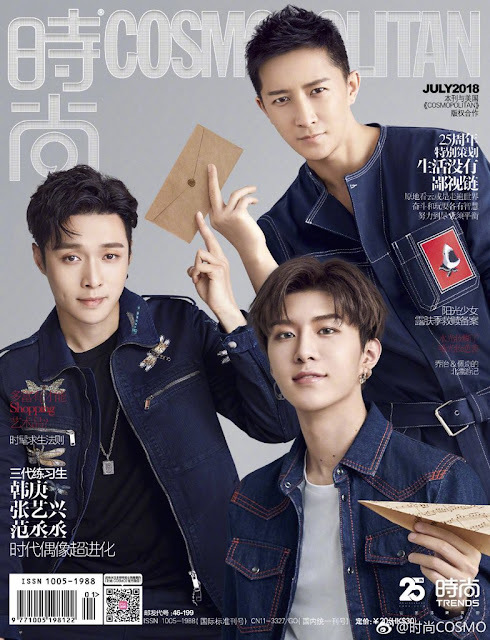 I know that guys also get "made up" for magazine shoots but the second one where they were all wearing denim was the one that took me by surprise! That's some distinct eyeliner and eyeshadows on Fan Chengcheng's eyes and some mighty shiny lip gloss! Hahaha! 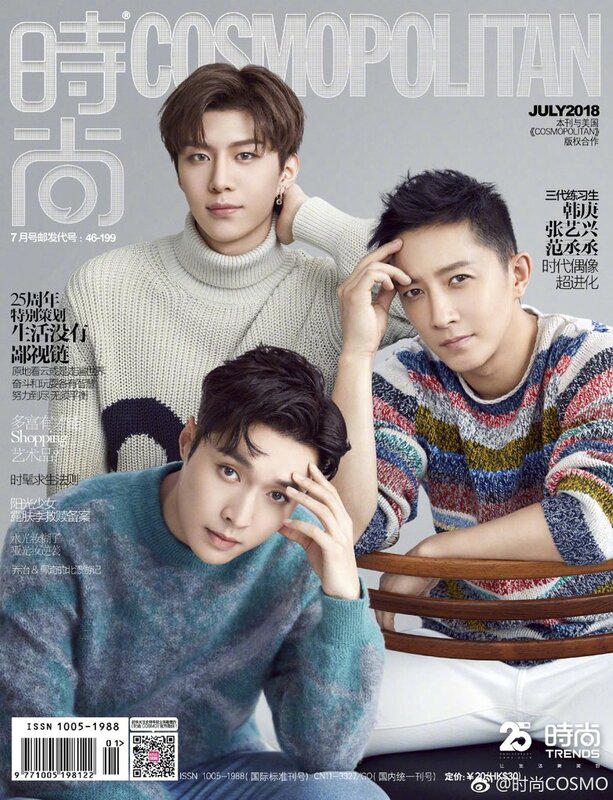 I don't know about you but I like how the other two guys looks more natural in comparison, especially Han Geng.